Guess what else I did while I was pregnant...wrapped up my second book! The Quilter's Paper Piecing Workbook was a big-time labor of love, chock full of helpful tips and tricks for paper piecing with ease, with gorgeous patterns to boot, and it's now available for pre-order on Amazon. If you've ever thought that paper piecing was beyond you, or thought it was just too hard, this book will hold your hand through getting started with this fantastically fun sewing skill. If you're obsessed with paper piecing, you'll find great fresh patterns to feed your obsession. All in all, I'm really, really proud of this book and can't wait to share more of it with you all mighty soon. The Quilter's Paper Piecing Workbook will hit store shelves in late May this year! Have a fantastic week everyone! 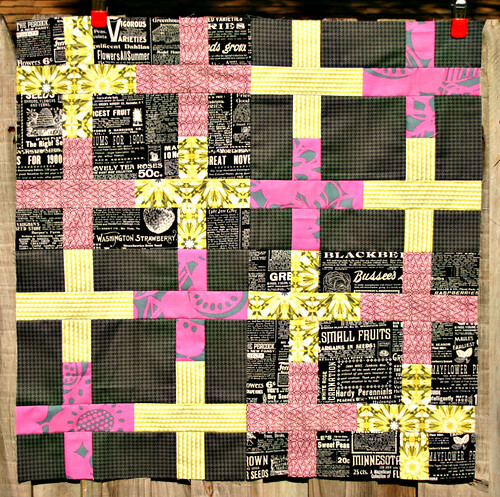 Whirling Dervish quilt - in Quilt Now, Issue 2! , the Whirling Dervish quilt, a paper pieced extravaganza of a quilt! Because the piecing is so intense, I knew the blocks needed some negative space to float on in order to really appreciate all the crazy piecing, so there's only four blocks in the quilt, floated on a boatload of negative space to yield a nice lap-sized quilt. Exploding Star and interview in MQU! Good morning everyone, happy Monday to you! I hope you had a great weekend. 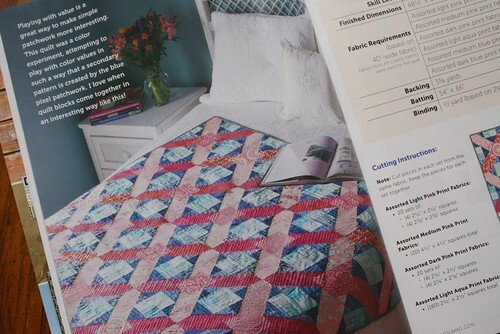 I must say, I did indeed have a great weekend, capped off my some super happy mail that was delivered to me on Saturday - the summer 2014 issue of Modern Quilts Unlimited with my name on the cover. Seriously?! Yep, that's my name all right. Wow. Granted, that's not my quilt, but gosh, to see my name on a magazine cover is just beyond astounding to me. The summer 2014 issue of Modern Quilts Unlimited features an interview with me, which was a lot of fun to do, as well as several photos of some of my favorite quilts, and one of my favorite photos of the munchkin, working away in EQ on a sick day a few months ago. He was super excited when I showed him the picture of him in a real, live magazine. There's also a pattern from me in the magazine, called Exploding Star. Exploding Star is (shocker) a paper-pieced star pattern that uses several different templates to create the exploding effect. I sewed this one up in assorted solids from Modern Solids II by Alissa Haight Carlton, and I love the sparkling effect they give to the piecing. The quilting on this mini is done in several different coordinating shades of 50 wt Aurifil, my go-to free-motion quilting thread. 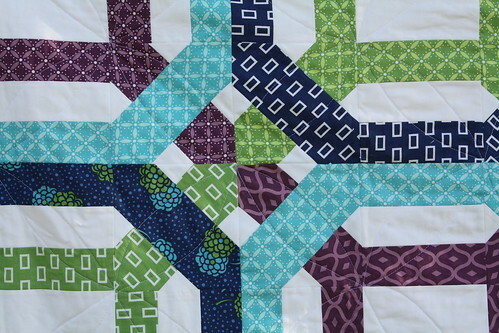 There's several different styles of fmq throughout the quilt, in the different areas, which was a lot of fun to do. I also did some "faux" straight line quilting, where I use my free-motion foot and outline certain areas of the quilt. My relationship with my walking foot is a bit lackluster, so I rarely use it - instead I do straight-ish line quilting with the free-motion foot, which is way more comfortable for me. This issue should be hitting your local Barnes & Nobles and Jo-Anns and such in the next few weeks, so keep your eyes peeled for it. There's some really fun patterns inside, including a fun pixelated guitar pattern by Penny Barnes. Have a great day! This quilt was something I sketched out nearly two years ago and it languished in my design notebook until I pulled into EQ a little over a year ago and shared it with the lovely folks at Modern Quilts Unlimited. I had a crazy idea of using the Riley Blake neon solids that had just come out at the time, and thought it would make a really bold quilt...bold is quite possibly a giant understatement with this quilt! Photographs cannot possibly show you how bright this quilt is. I literally felt like I needed to put sunglasses on just to be in the same room with those neon fabrics when I was working on this quilt. It was really comical when I unfolded the quilt to show to a friend before I sent it off and she shielded her eyes. 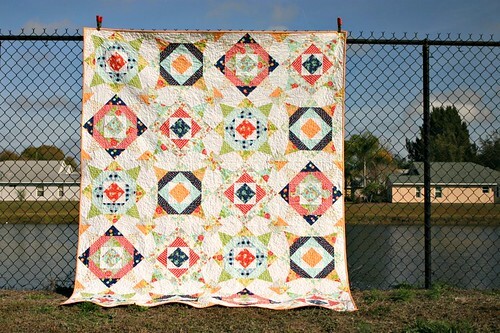 That being said, I really love the design of this quilt, and I think the neon solids make it even more unforgettable. You'll find this quilt pattern featured in the Spring 2014 issue of Modern Quilts Unlimited, alongside some other beautiful quilts from Jacquie Gering and Heather Bailey plus a profile on Heather with loads of beautiful photographs from her sewing space! 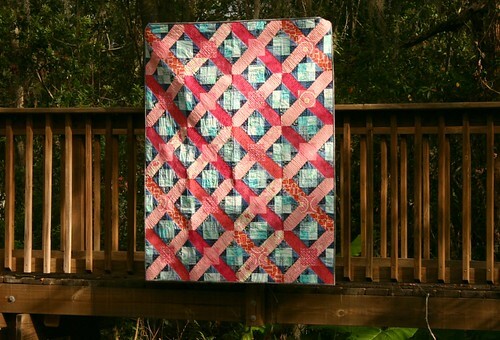 You can usually find Modern Quilts Unlimited at Jo-Ann Crafts stores and Barnes & Noble. It's one of my favorite quilting magazines these days, so I definitely recommend you check it out! I'm so happy to share the newest pattern in my Pattern Shop this morning, Chain + Link - I initially made this quilt about a year ago for Quilty magazine, using some fabulous navies and greens from Vanessa Christenson's Simply Style collection, and I loved the way it came together. I had a lot of fun playing with the planning on this one, and ultimately, I'm glad that I went with the color progression that I did. I had paper-pieced my quilt, and when the magazine came out, the instructions were written for piecing the quilt using templates. Now, if you've followed my blog for a while, you know that I intensely dislike working with templates. I'd pick paper piecing over template piecing any day of the week, so I knew I wanted to release my own version of the pattern when the time came, and that time is now, yay! 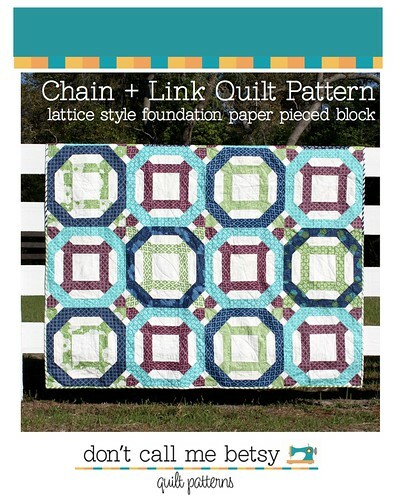 In the Chain + Link pattern, you'll find detailed foundation paper piecing instructions, complete with photographs to illustrate the steps and the paper piecing templates you'll need to make your own Chain + Link quilt. With four finished sizes to choose from, ranging from a small baby quilt to a large queen/king quilt, you'll find lots of ways to use this pattern. You'll also find a coloring page so that you can experiment with your color choices for your Chain + Link quilt, and have a little coloring fun at the same time! I had some great pattern testers help me finish up this pattern, so thank you ever so much to Jacey, Lisa, and Peta. They made some beautiful blocks from this pattern, check them out! Lisa, who you'll find on Instagram as @brazenlisa - and Lisa was seriously brazen, she used flannels for her paper piecing! Peta of Petaquilts, who made a darker Chain + Link block to see what the block looks like in a darker, more moody variation. There's three other patterns that are in the testing phase right now that I'm working on releasing as the month progresses. To celebrate, for the month of March, each new release will be on sale for the week of its release, so for this week that means today's new release, Chain + Link, is on special for $6, rather than the regular price of $8! You can find all of my quilt patterns both in my Pattern Shop and on Craftsy. If you're a shop owner and are interested in stocking my paper patterns at your shop, please contact me directly at elizabeth(at)dontcallmebetsy(dot)com. 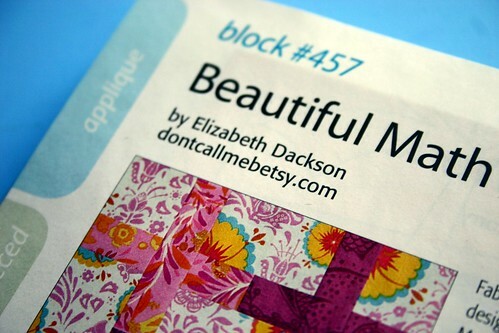 Don't forget to add your creations to the Stitching with Don't Call Me Betsy Flickr group and/or to tag me on Instagram or Twitter with #dontcallmebetsypatterns . Have a wonderful day! 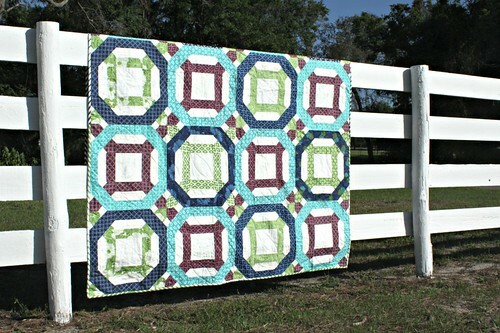 I'm excited to share another quilty finish, Chain + Link, featuring V & Co's gorgeous Simply Style fabrics. This quilt and pattern are featured in the September/October 2013 issue of Quilty magazine, available now. You can find copies at your local craft and quilt shops, as well as at Fat Quarter Shop and Quilty. This one-block quilt was inspired by some tilework I spotted last year and drew in my sketchbook. 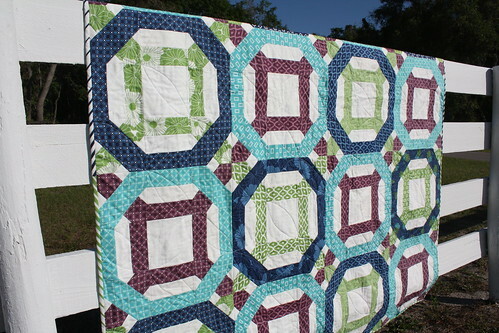 Once I paired it with Vanessa's gorgeous prints, it was exactly the quilt I hoped it would be. Vanessa seriously has a gift for creating great stash building fabrics that look great when used together, and look awesome when mixed with other collections as well. I love the way the blocks interact with each other and come together. This quilt is probably the closest I've ever come to making an optical illusion! I love it! I quilted it with 50 wt white Aurifil thread color number 2024 , my personal favorite. I had thought about doing some thread matching and specialized quilting, but in the end, I didn't have the colors I needed, and I decided that I wanted more of an all-over design, so I stuck with good old white. I stitched a simple orange peel design on the quilt top, which really works nicely with the patchwork in this quilt, I think. And if you'd like to make this exact quilt, you can pick up a quilt kit with the magazine as well as all the fabrics you'll need to sew up the top at Fons & Porter's online shop. The kit is on backorder at the moment, but is expected to be in stock soon. You can find Simply Style fabrics in stock at The Intrepid Thread, I Don't Do Dishes, and Stash Modern Fabrics. size: 63" x 78 1/2"
I love getting quilty magazines in the mail. 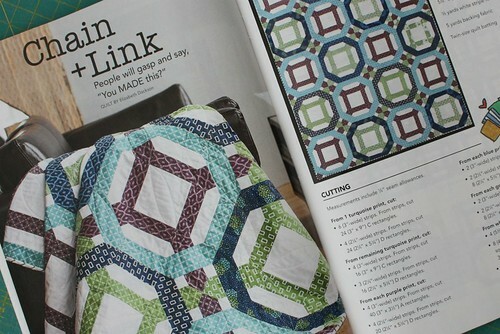 This week I received a copy of the new summer issue of Modern Quilts Unlimited in the mail. I love that magazine! The photography is always so stunning, and I always feel inspired as I flip through the pages. I set the magazine in the car to enjoy during my wait in the kindergarten car line, only to be surprised when I saw one of my own quilts in it! I can't believe I forgot about this quilt! Gradation is a quilt that I sketched and sewed up quite a long while ago - back in February of this year, right before my son's birthday, to be exact. I wanted to play with color and values and try to create some repeating geometric patterns while sticking with simple piecing. There's nothing more complicated than a half-square triangle in this quilt in terms of piecing! This is the quilt I was working on earlier this year when my Viking started acting up on me, with weird stitches and such. This quilt was the first I really sewed up with my Juki, and it's when I fell fully in love with piecing on my her, so it's got a special place in my heart as a result. The fabrics in the quilt are a wide assortment of Art Gallery Fabrics in shades of pink and blue - from Oval Elements, Nature Elements, Splendour 1920, Lilly Belle, Luxe in Bloom, Lace Elements, Modernology, Floressence, Carnaby Street, and Rhapsodia. You can find lots of these prints still in stock at Intrepid Thread and Hawthorne Threads. Introducing the Ferris Wheel Quilt! 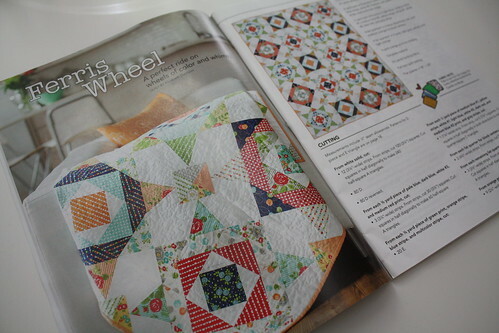 If you're a subscriber to Quilty, you're going to really enjoy the newest issue, featuring my new quilt, Ferris Wheel. 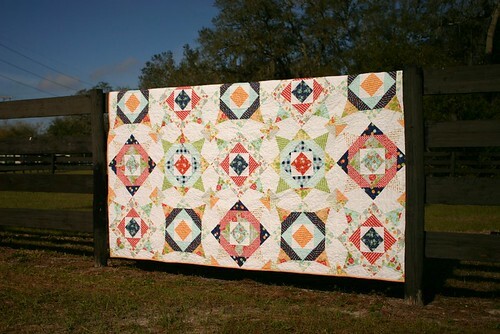 The quilt features Bonnie & Camille's Happy-Go-Lucky collection in extra large, fun blocks, perfect for a picnic quilt. I foundation paper-pieced my blocks, although the magazine pattern uses template piecing. It's a really fun quilt to put together, and the extra-large size of the blocks makes the blocks come together a bit more quickly. I love the summery feel of these fabrics, and the collection is so aptly named - you really can't work with these fabrics without feeling a bit cheery! If you live in an area where the Original Sewing & Quilting Expo visits, you can actually see this quilt in person, as it's travelling with that show as a part of an exhibit of quilts from the pages of Quilty. I'm looking forward to putting this quilt on the guest bed when it finally comes home some time next summer! 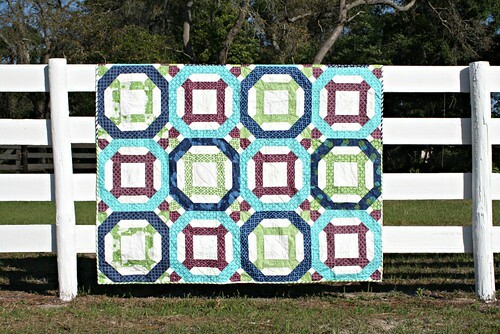 I'm so excited to have a block in Quiltmaker's 100 Blocks, Volume 6! This newest volume of blocks will hit stores November 13th. 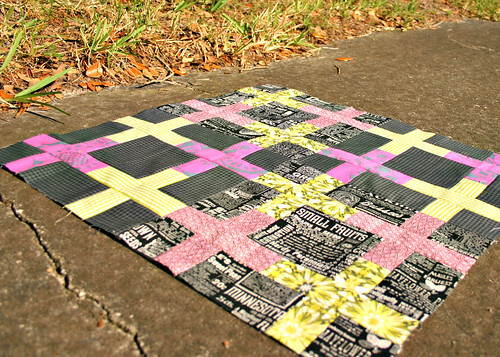 You'll find my block, Square City, on page 52 of Quiltmaker's 100 Blocks, Volume 6! My block is a simple patchwork block that can repeat in really fun and cool ways. I showed it in two colors, aqua and gray, and when you repeat those colors throughout a quilt, you get a pixelated feel to the quilt, which I really enjoy. I also rotated the blocks for more movement. 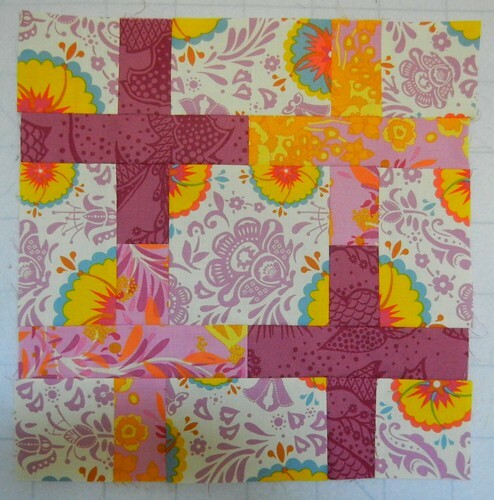 This block also works great in a scrappy rainbow quilt. This layout makes me want to dig into my scrap bins right now! My block can work fabulously showing off your favorite fabric collection, too. Here, I'm showing it using Denyse Schmidt's Shelburne Falls line, due to hit shops later this fall. The 100 Blocks blog tour continues through the rest of this week, so be sure to check Quiltmaker's blog, Quilty Pleasures, for more links to designers sharing their blocks. Pssst....would you like to win a copy of Quiltmaker's 100 Blocks, Volume 6 for yourself? There's tons of beautiful blocks in it, I highly recommend it. Leave me a comment here, and the winner will receive a copy of the newest volume of Quiltmaker's 100 Blocks as well as my newest pattern, Sea of Stars, which will be released tomorrow! Please be sure to come back to see it :) Entries will be accepted through midnight EST Friday, November 9th, and I will announce the winner on that same day. 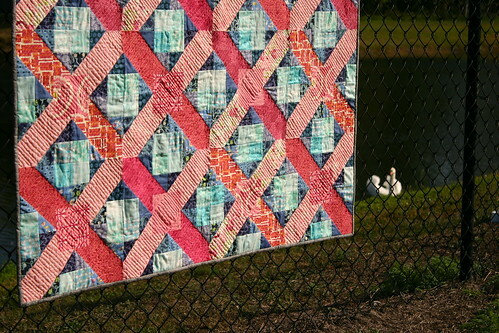 Hello there, and welcome to day two of Quiltmaker's 100 Blocks blog tour! I'm super excited to say that I have a block in the volume five issue, hitting newsstands any day now. If this is your first time stopping by my blog, welcome! My block is in some wonderful company in this issue, alongside fabulous blocks from some of my super talented friends Lee, Faith, Katie, and Melissa. You can find my block, #457, on page 52. I spent a little time this weekend starting on a mini-quilt featuring my block in a color scheme that I've been meaning to try for a long time - black, lime, and fuschia. I haven't finished it just yet - I have a sneaking suspicion this might turn into a larger quilt, as I'm really enjoying these colors together! 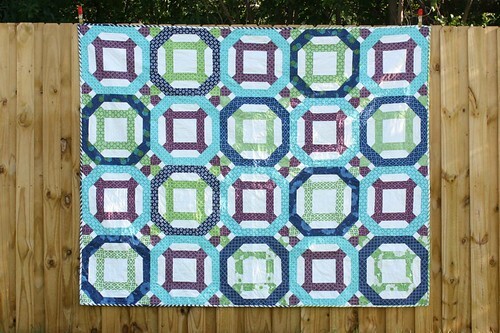 Be sure to check out Quiltmaker's Blog, Quilty Pleasures, for more prizes and blog hop participants! The 100 Blocks Volume Five Blog Hop runs April 30 - May 4. To celebrate the release of volume five, Quiltmaker is giving away a copy of 100 Blocks to one of my readers and I will also be giving the lucky winner their choice of one of my patterns. To enter the giveaway, please leave me a comment and tell me about your favorite book that you've read recently - quilty or otherwise. I'm always on the hunt for a good read :) Please be sure to include your email address, so I can get in touch with you if you win! This giveaway will be open until midnight EST Sunday, May 6th, and I will announce the winner shortly thereafter. I was so excited when my far-away quilty friend Lynne asked me to participate in a Fat Quarterly Designer Challenge. When I learned it was an Aurifil thread challenge, I was even more excited, because I've got six or seven spools of Aurifil that I haven't had the guts to bust into, mainly because sometimes I irrationally fear change. This was the kick in the pants I needed to finally try the Aurifil, and wow, I sure am glad I did! I made a little rectangle miniquilt that I aimed to use as a table runner, but it's hanging on the wall in my sewing room, and I kind of like that a lot at the moment. This little miniquilt reminds me about how I want to try new things this year, like using more variety in my quilting, so I think it might just stay in my sewing room for a while. I love the color of the thread I used for hand-stitching. It's quite possibly my favorite shade of blue ever! My hand-stitching is far from even, but I do still love the look of hand-stitching, even if it is slightly wonky like mine. Thanks again, Fat Quarterly and Aurifil! This was a lot of fun! Hop on over to the Fat Quarterly blog to read more about my Aurifil experience.